with the versatile Jupe de Vie. This entry was posted in Style, The Daily, WEEKLY FEATURE and tagged beach, bikini, blog, coverup, dress, fashion, gstring, lounge, ocean, plus, poolside, poolsidestyle, resort, size, skirt, sky, sleeve, style, tank, top, versatile, video, wrap on March 20, 2017 by Nikki Babie. We are a day or two away from launching part one of our video tutorials. 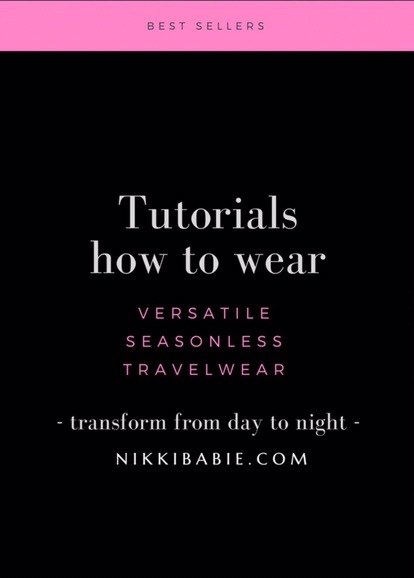 Each item from Nikki Babie can be worn between 3-20 ways. Seasonless essentials perfect for travel. This entry was posted in EXHIBITS, Style, The Daily and tagged #vicfw, clothing, day, evening, fashion, love, multi, night, nikkibabie, nikkibabieinc, office, style, tie, tutorials, twists, versatile, victoria fashion week, wearable on February 21, 2017 by Nikki Babie.